Title: 'Ceylan et les Maldives... Paris, 1652. From L'Asie, LAffrique, L'Europe, et L'Amerique, en plusieurs cartes nouvelles, et exactes... , Paris, [1660.] Engraved by Abraham Peyrounin. 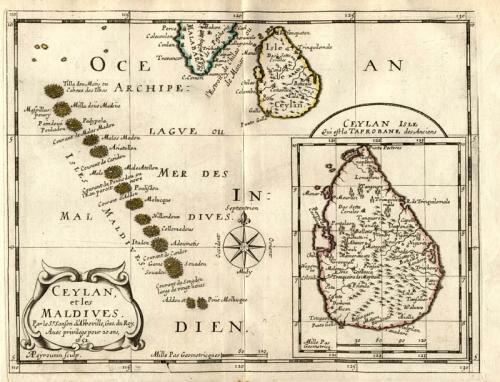 Fine, original, copper-engraved map of Ceylon (Sri Lanka) & the Maldives Islands with original outline hand-color, by Nicolas Sanson D'Abbeville: Fine dark impression, bright original color, heavy paper, large margins, light browning near edges, otherwise fine. Faint ink stamp of Western Reserve Historical Society on verso. A beautiful, detailed map with an elegant title cartouche. These quarto maps by Sanson were distributed first in regional atlases (Asia in 1652, Africa in 1656, Europe in 1648, and America in 1658.) . The present map is from a composite atlas comprising all four regions, with a unifying title-page that I cannot find a reference to in standard bibliographic sources. Although undated, the publisher address (rue S. Jacques, a l'Esperance) suggests a date of ca.1660.